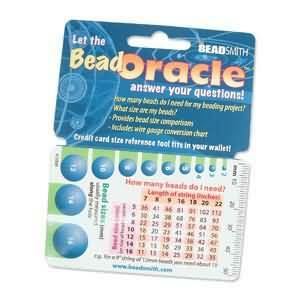 One of the best things about beading is that there seems to be an endless variety of sizes and styles for you to use. Whether you want to make something delicate for date night or something fun and chunky for lunch with the girls, you are sure to be able to find the perfect bead for your project. Here is a bit more information about the sizes of beads available and how to use them for your designs. Beads are usually measured in millimeters, using the metric system. Just like with the United States customary units or Imperial system (inches and feet), the smaller the number, the smaller the beads. For round or almost round beads, the measurement indicates the largest diameter of the bead. For non-round beads, two measurements or more may be provided to indicate the largest dimensions in two directions. For example, an oval bead would typically have the diameter and length listed, such as 4mm x 12mm. As a simple rule of thumb, 2mm beads are tiny, 4mm and smaller would be considered small beads, 5mm-9mm medium size beads, 10mm-16mm large beads, 17mm and up, extra large beads. When shopping online, keep a small caliper or reference card at your computer to help you imagine the true size. Since they are so small, seed beads are measured using a unique system using an aught. In the past, an aught referred to how many beads could fit into a designated space. However, the method of measurement is no longer used, although the term “aught” is maintained when describing the size of seed beads. When purchasing seed beads, keep in mind that the smaller number indicates a larger bead, while a larger number is used for smaller beads. 6° (6/0) are larger beads than 11° (11/0). If you want something that is elegant and delicate, you have several options. While we often think of small beads when we create a delicate piece, you can also use larger beads. Choose glass beads that reflect a lot of light, or use a gemstone in your design for a touch of elegance. If you are making a necklace or bracelet, you may want to use a single large bead surrounded by some smaller beads. For earrings, consider making something slim and dangly or small and simple. Sometimes you want to express your fun-loving side using your jewelry, and beads are a great way to do that. If you are spending the day with your best friends or are meeting with your book club, you can wear bold and fun jewelry that is colorful and bold. Choose bright, large beads, and don’t be afraid to combine different colors and shades. By making colorful and fun pieces, you can experiment with your creativity. No matter what style of jewelry you want to make, don’t be afraid to take some chances. Experiment with different designs, colors and sizes to find the perfect combination for you. Use a few large, glass beads surrounded by smaller beads for eveningwear or go with large, chunky beads for a day of fun. The most important thing is to have fun with whatever you are making. 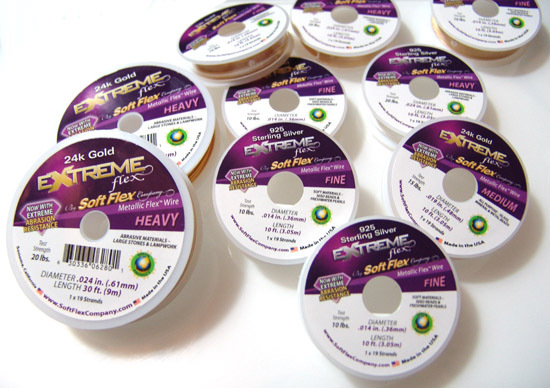 Soft Flex Mini Spools – Aren’t they cute? I’m unpacking a shipment of Soft Flex Beading Wire this morning. The new 10ft mini spools in Extreme Sterling Silver and Gold arrived too. They are adorable! Regular spools on the left, mini’s on the right. 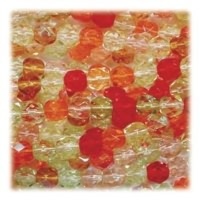 At just 2″ in diameter, besides being ideal length for budget conscious beaders, they will tuck right into an on-the-go bag easily. Look for these here.